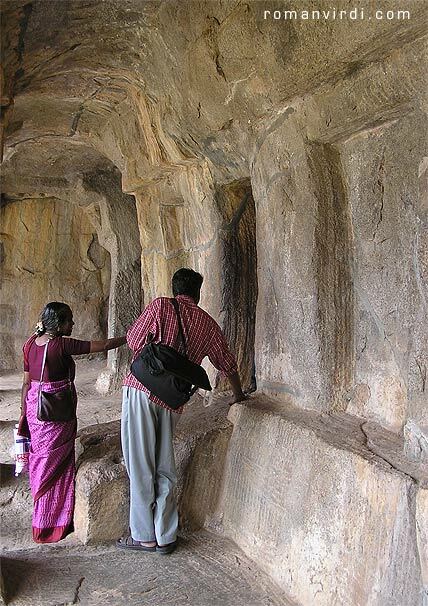 This small town, about 1-1/2 hours of travel by road from Chennai, is home to ancient stone carvings of such uniqueness to be declared a World Heritage Site by Unesco. 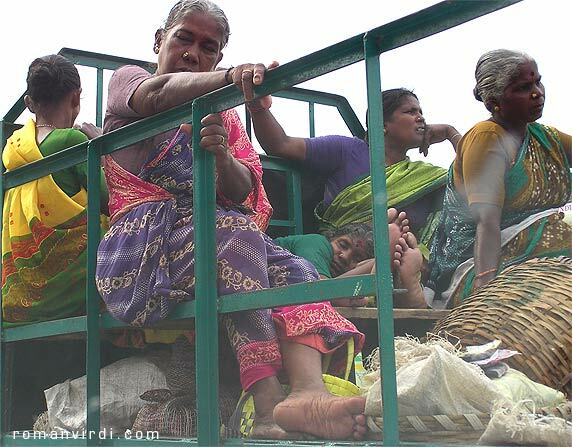 The sights are comfortably near to each other to be covered by foot yet require about a day to digest properly. 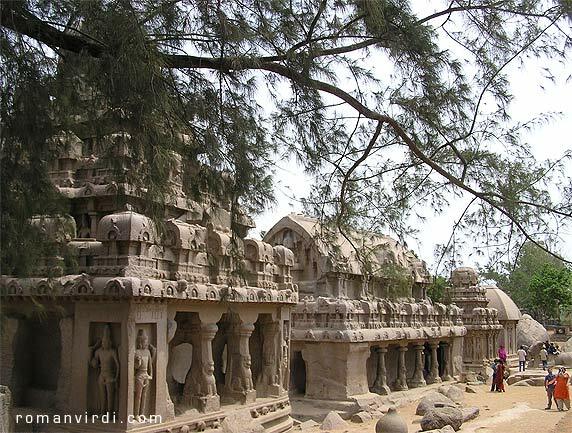 The main sights are the Shore Temple, the Five Rathas, Arjuna's Penance and The Mandapams on a small hill. 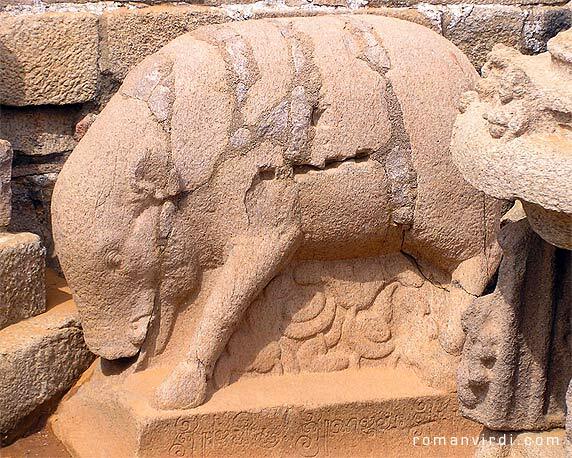 The area along the tiny but pretty and famous Shore Temple was ravaged by the Indonesian earthquake Tsunami, although the site itself was untouched, being on higher ground. 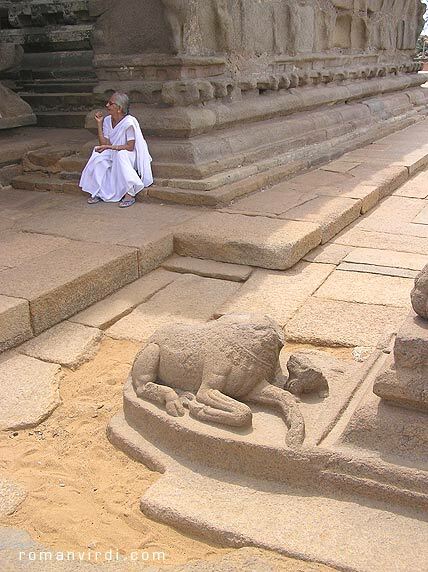 The shore temple, built around 700-728 A.D. 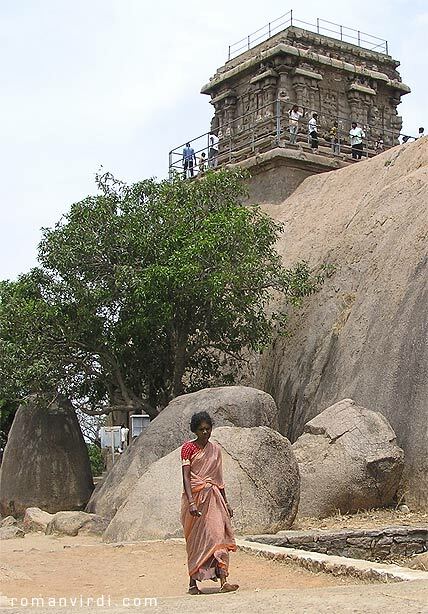 The temple is being affected by the rough sea and salt-laden winds, for which measures are being investigated. 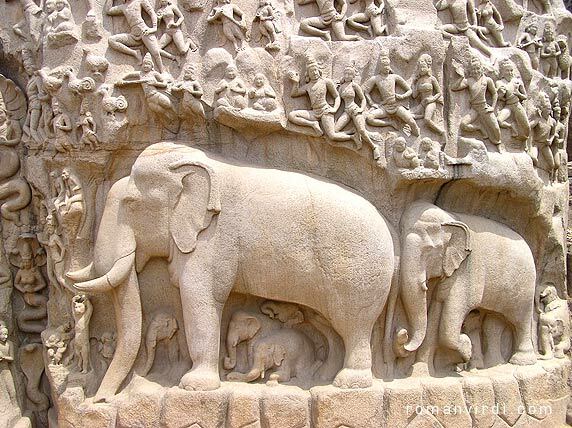 "Mahabalipuram (as the place in called today) was known variably as Mallalkadal-Mallai and Mamallai in ancient Vaishnav hymns of the 6th-8th century A.D. 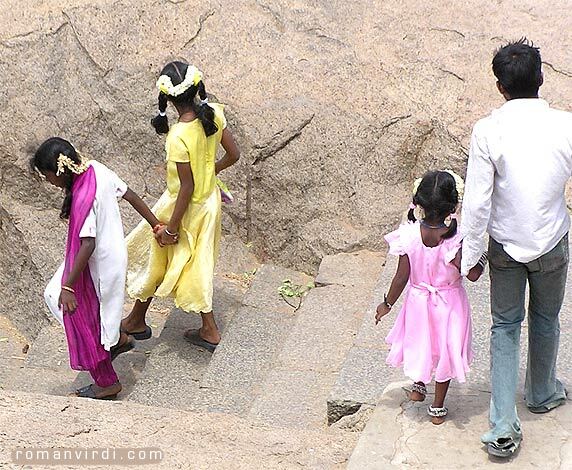 The place, however dates back to early historic times on the evidence of stray pottery and roman coins. 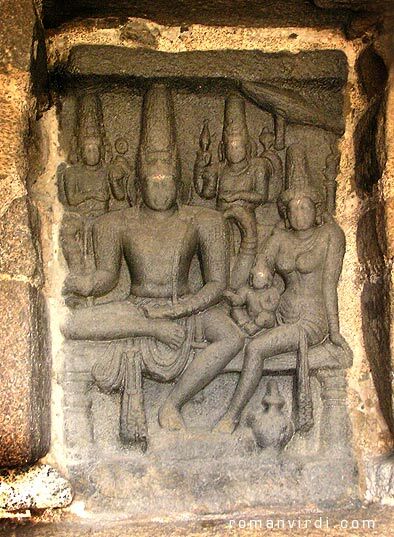 All the monuments here except for the medieval Vishnu temple in worship in the heart of the village clearly owe their authorship to the Pallavas of the Simha Vishu line who ruled from Kanchi. 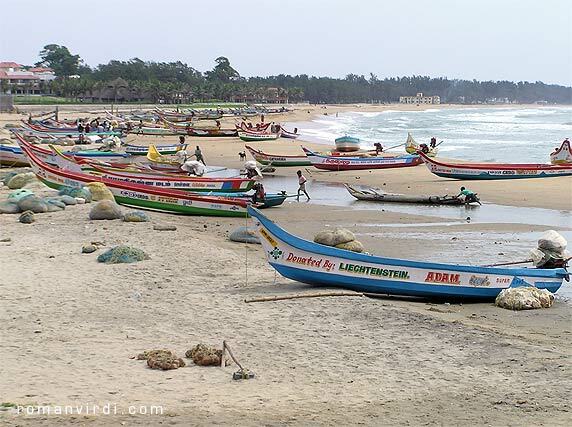 Mahabalipuram was one of the Pallava ports. 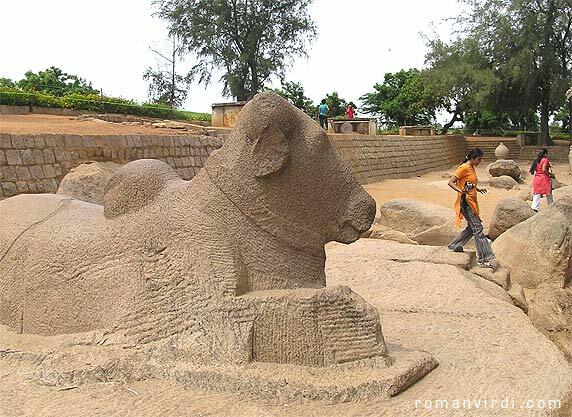 A majority of the monuments (rock cut and monolithic) would seem to belong stylistically to the region of Narasimha Varmani, Mamalla (630-688 A.D.) while some others should be of the time of his successors such as Parameswaravarman (672-700 A.D.) and Narasimhavarmanii (Rajasimha) 700-728 A.D. All the four structural stone temples however, belong only to time of the last mentioned king. 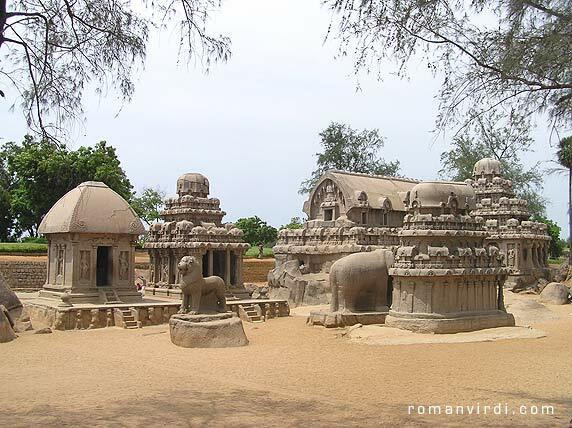 The monumental remains at Mahabalipuram are informed by three kinds of mode of execution: excavated cave temples, monolithic temples, models and structural erections. The first mentioned are essentially confined to the whole black granitic hillock rising in the centre of the village (e.g. 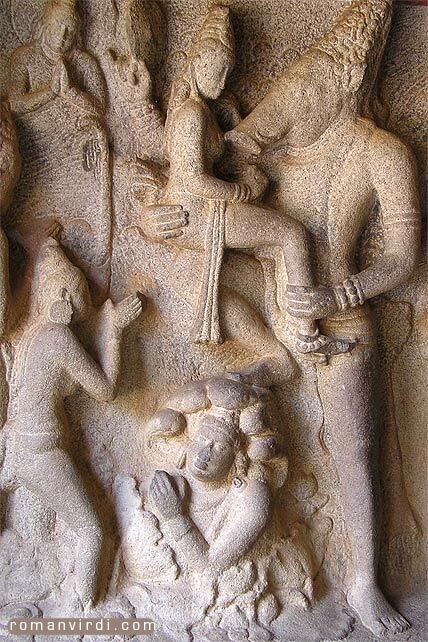 the Trimurti, Mahishasura Mardini, Varaha Mandapa, Ramanuja Mandapa, Dharmaraja Mandapa) etc. 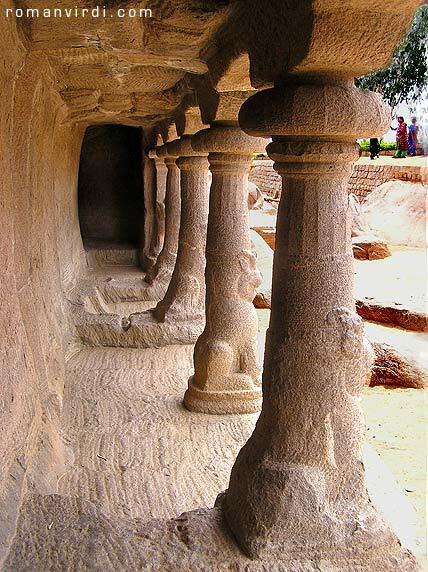 The pillars are both of simple square and octagonal shaft type as well as ornate fluted and lion based forms reflecting the elements of the pillar order. 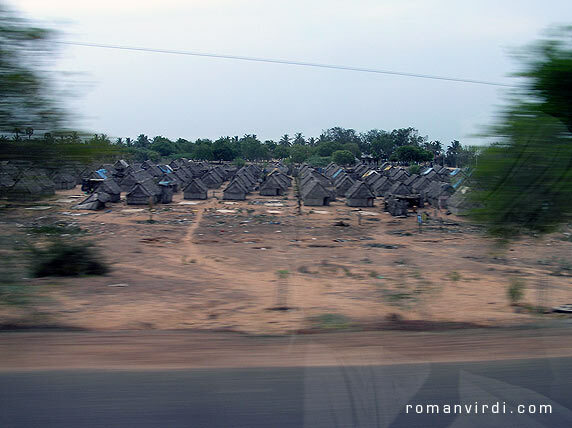 The monolithic rathas, however display the full form and features of the contemporary temple style and show many varieties both in ground plan and elevation they are of square (Dharmaraja , Arjuna and Draupadi Rathas), rectangular (Bhima Ganesha Rathas) and apsidal rathas, sahadeva rathas and range from single to triple stories. 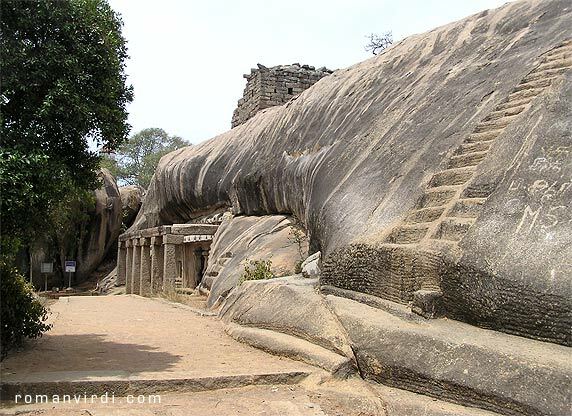 They carry art motifs as well as carved panels of many divinities on them together with the Valayankuttai and Pidari Rathas as isolated boulder on the western side of the hillock they represent the most impressive and the oldest preserved Vimana models of Tamil Nadu. 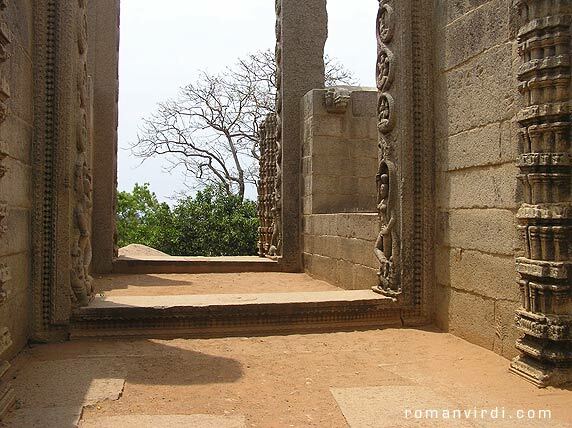 The earliest and most modest of them is Mukundanayanar temple in the sand dune to the north of the light house and is very ornate though small sized and dilapidated. 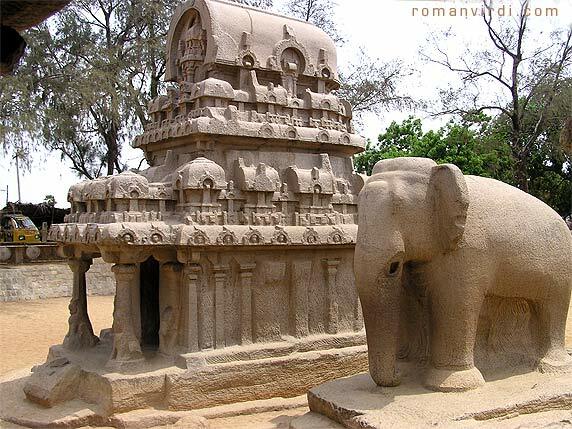 The shore temples in the other hand are the best and give the most finite layout of a southern Vimana confute with Prakara, Dvarasala etc. 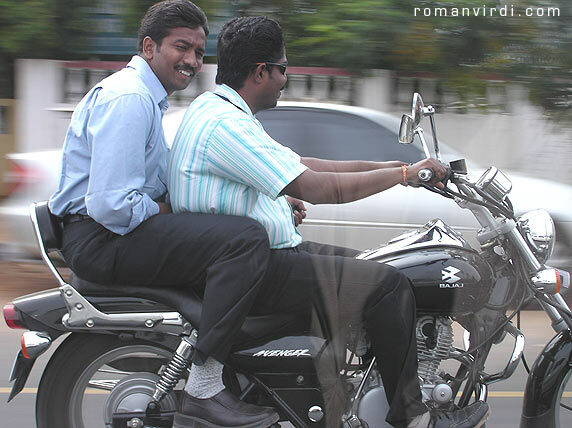 and majestically fringe the sea. 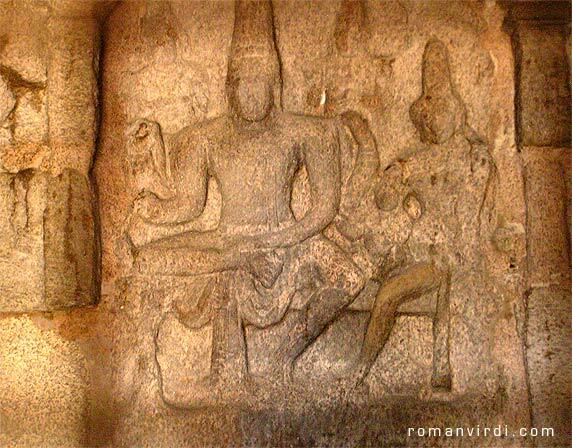 Most of these temples have Samaskanda (or vishnu or Durga etc.) as the case may be on the back wall of sanctum. 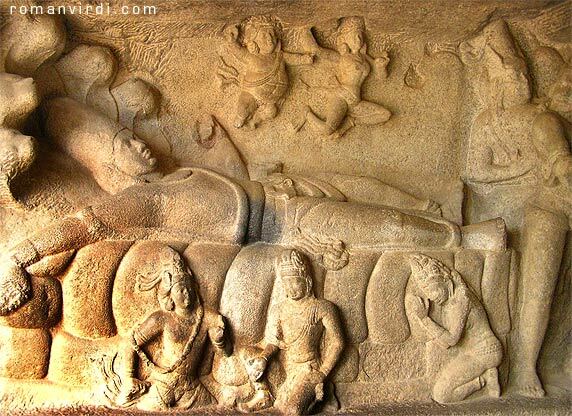 The bas reliefs of Arjuna's penance and the Govardhana-Dhari are again another very important class of creation of Pallava activity. 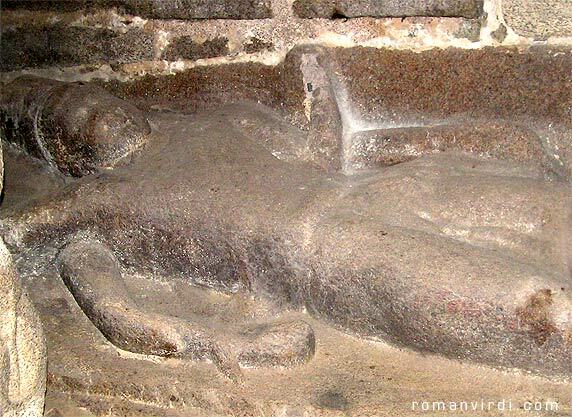 No less unique are the portrait sculptures with laurels, in the Adiyaraha cave temple, seemingly representing Simhavihsnu and Mahendravarman I. 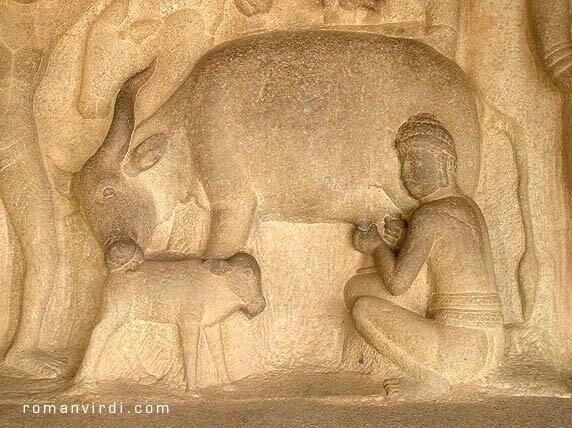 Many minor carvings of merit lie scattered in the place. 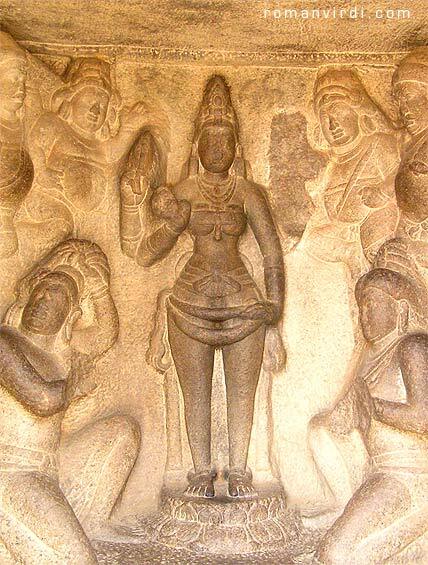 They all bear mute witness to the virility of Pallava art and religious patronage. 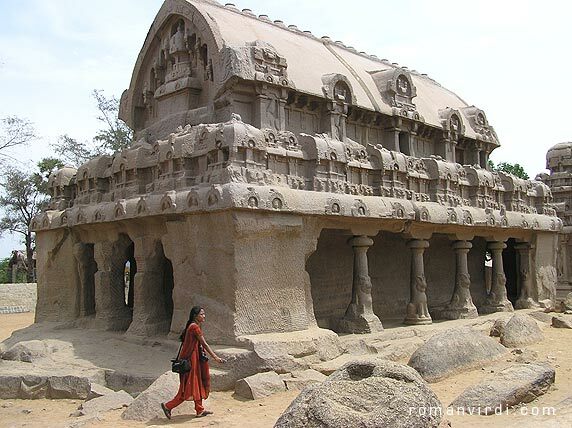 The standing structural temple which show a confidence in stone masonry constructions for first time, again have both simple as well complex models." 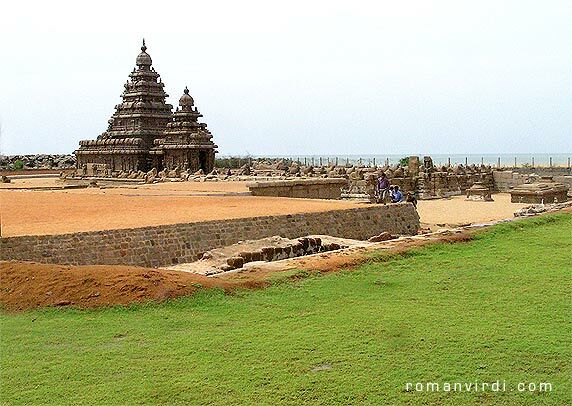 The shore temple area is fenced off. 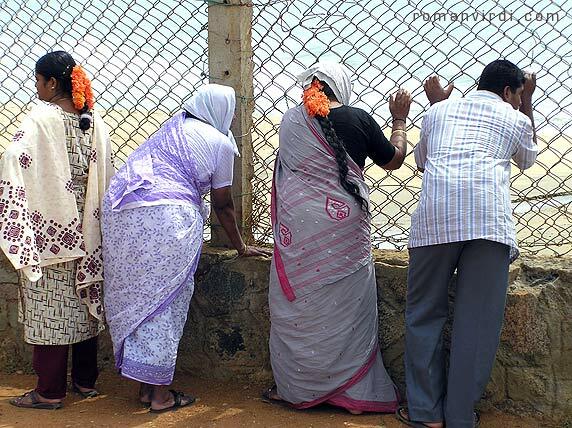 Some tourists looking out to the sea. 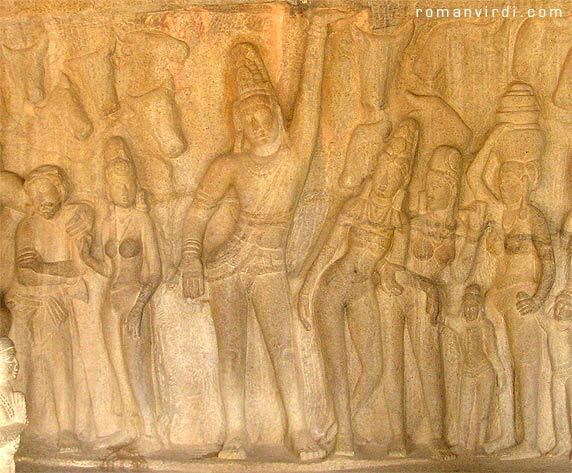 The Five Rathas complex is quite compact. 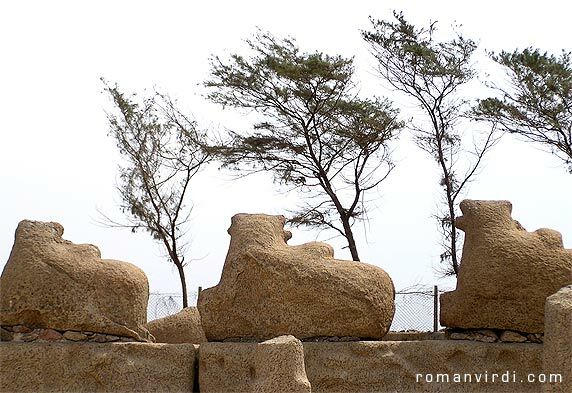 They were invisible being covered by sand before being excavated by the British.